Debt is a problem that millions of people deal with each year throughout the world. Credit cards make it too easy for people to spend money that they don’t yet have, which is one of the most common ways people build up debt. Another common way debt accrues is from major purchases people cannot afford. Then there’s student loan debt, mortgages, auto loans and various other ways people can get into debt. The problem becomes even more difficult when getting a divorce. How is debt handled? Who is responsible? Let’s take a look at these questions and more in today’s post. The debt you and your spouse have accrued during the marriage cannot technically be divided in a divorce. You can divide the responsibility. For example, one spouse could be responsible for paying off one credit card, while the other could be responsible for handling the rest of the mortgage. It all depends on your preferences and how you want to come to an agreement with your spouse. Before heading for a divorce you should do your best to pay credit card balances down. The less debt to your name, the less you will be responsible for after the divorce. You also reduce the risk of your spouse not making payments, which will affect your credit score negatively. If you or your spouse has already filed for divorce you should stop using joint credit cards immediately. Open a credit card in your own name and begin to use it. This will help build your credit score. If you have too much debt to your name from the marriage you should sell the marital home. Pay off the remaining mortgage of the home and use the rest of the money to pay off the credit cards. This will make it easier to handle debt with your divorce. It’s likely that the two of you will want to have your own home after the divorce goes final so selling the marital home is a good idea. The minute you decide it is time for a divorce you should file debt documents with the court. These documents should outline all the debt on the joint credit cards that you have in the marriage at the time you file for divorce. 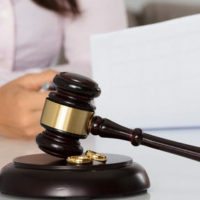 Having this documentation filed with the court helps prevent you from becoming responsible for any debt your spouse decides to rack up on the credit cards out of revenge for the divorce. As mentioned earlier, it’s a good idea to stop using credit cards in both of your names and then open individual accounts. Make sure you cancel the joint credit cards so that neither one of you can use them to make purchases anymore. Dealing with debt in a divorce is not easy. The debt might be the reason why your marriage has come to an end. Contact Zagazeta Garcia LLP in Mississauga to discuss your situation by scheduling a consultation today.